For us “Anconetani”, the Monte Conero is simply “the mountain”; when we come back from a trip we see it in the distance, imposing and majestic overlooking the sea, we just need a glance to feel already at home. The mountain is a green paradise, a pride of environmental tourism for our region and, for us Anconetani, an inexhaustible source of natural beauty to relax the soul and satisfy the sight. From this year with the Conerostyle will be possible to participate in afternoon excursions and go to the discovery of trails and breathtaking views, thanks to several hiking itineraries designed to dot for the summer season, we will flee from the work, from the hot asphalt and boredom umbrella to take a walk in the shade of the woods, immersed in the unique colors of a rocky promontory that plunges into crystal clear waters. Everything will take place in an atmosphere of serenity and friendship, accompanied safely by a local Environmental Excursion Guide, there to tell the secrets of this magical place, help to read the landscape and satisfy every curiosity. In short, what else to say, this place removes us the words, try to believe! 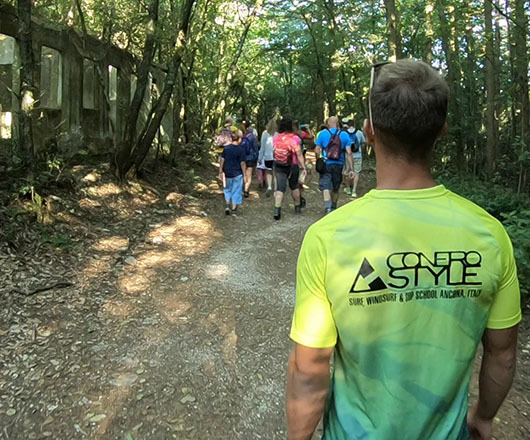 Find out in the section below the services that the Conerostyle school can offer for Trekking in the Conero Riviera at the Portonovo and Marcelli offices. The excursions will take place every day except Tuesdays and Thursdays. The duration of each excursion will be approximately 3 hours, including breaks starting at 4.30 pm. The cost of participation is 10 euros per person and the excursion will start when a minimum of 4 participants is reached. It is recommended to wear suitable shoes (preferably for trekking) for safety reasons the guide will not participate in the excursions who will wear flip-flops or slippers or footwear unsuitable for natural paths.